Imagine for me, if you would, this scenario: you are trying to make a diagram for a lab report (or assessment or poster or whatever) but you can’t find the right figure. So you draw something that resembles what you want, or you use an image you found online that is similar to what you want, but then you spend almost as much time identifying and discussing the weaknesses of the model as you do working with the model itself. [ESPN Documentary Narrator Voice] What if I told you there was a free way to make high-quality, detailed models with your students? My wife’s uncle shared BioRender with me this week, and I knew I needed to share this ASAP. Watch this intro video you’ll see when you sign up for a free account, and try to act cool… I’ll wait. DID YOU FREAK OUT A LITTLE BIT?! I did. (OK, maybe more than a little bit.) There is a lot to explore with this, but here are some highlights for me. 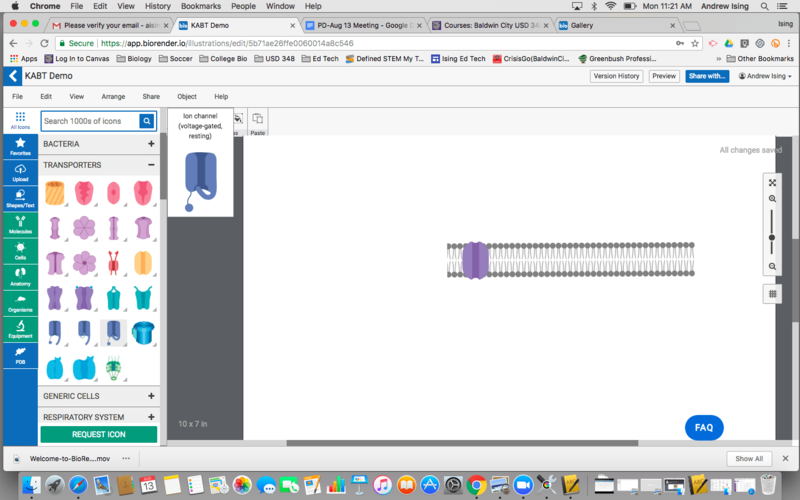 Not only are there 1000s of icons you can add to your figure, but you can control the color scheme for many of them and add labels to make your models even more robust. 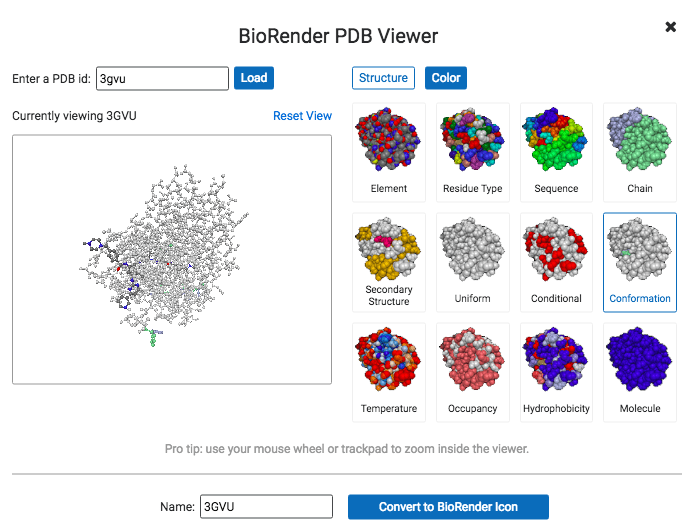 It has some built-in support to pull models from the Protein Databank. 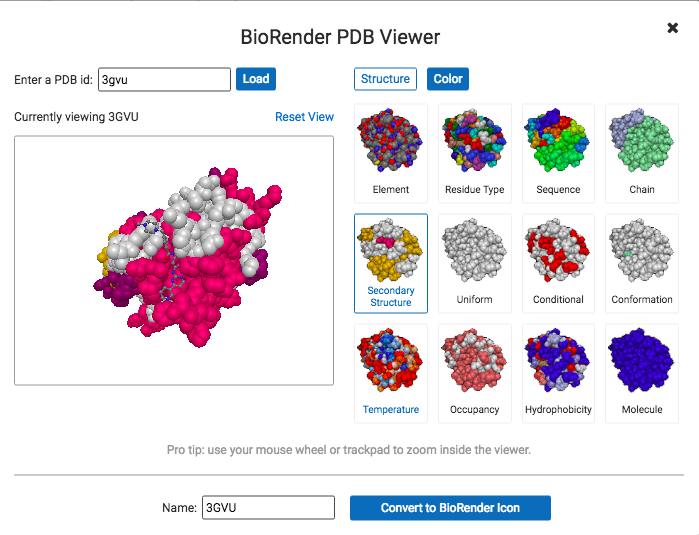 When you have the EXACT protein you want to use, you can control how your protein is visualized and rotate the protein so you show the exact part of interest. After Andrew Taylor’s Fall Conference presentation on 3D-printed models, I went looking for the proteins associated with the pharmaceutical product Gleevec. I encourage you to go check this out. 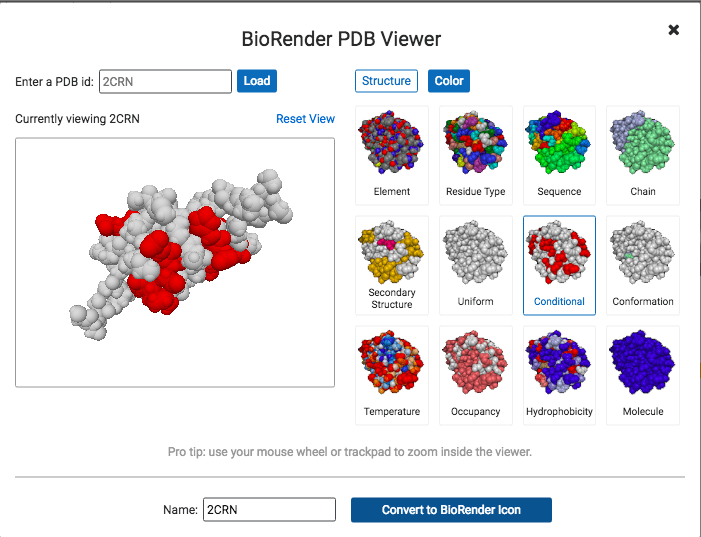 Visit https://biorender.io/ and create an account. Once you start creating, share your best figures with us here or on social media. I may be speaking for myself here, but I can’t wait to start using and making these models with my students! 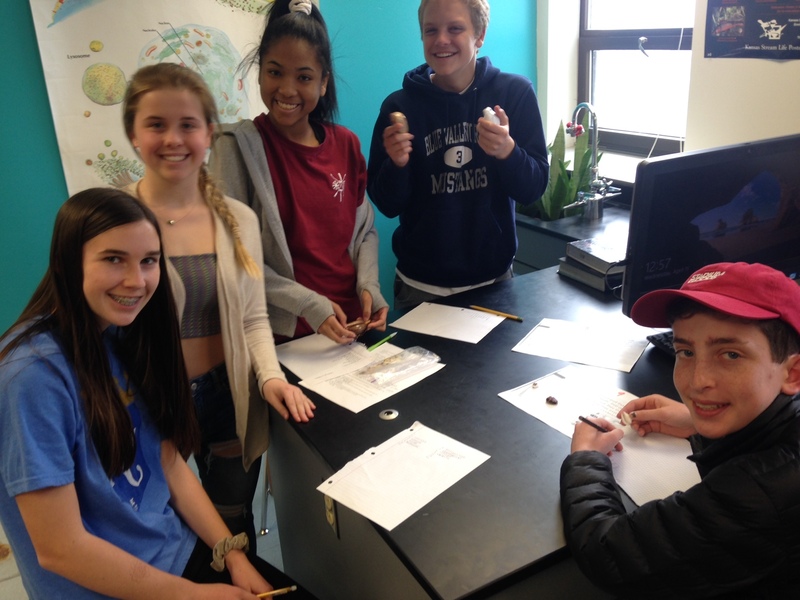 One of the old standby activities of biology class is collecting, labeling, and classifying insects. I remember this was one of the true highlights of my life. When I was a young child I began collecting insects. The night before our collection was due several cute giggling girls in my ninth grade class showed up at my house asking if they could have some of my collection. The next week when we had our collections graded mine stood out among other less ambitious attempts which looked more like they had been collected with a shoe than a net. It was a rare moment where my nerdy habits were celebrated. Rightly, insect collections have fallen out of favor in modern biology education. Bug collecting and classifying is hard to justify as a 21st century skill. Still, I think we shouldn’t forget about the value collections can have. Catching the bugs is a great way to compare and analyze biological forms.I think that there are two significant ways collections can be used in our evolution unit. First, collections allow students to consider the obscure insight of variation in a population. 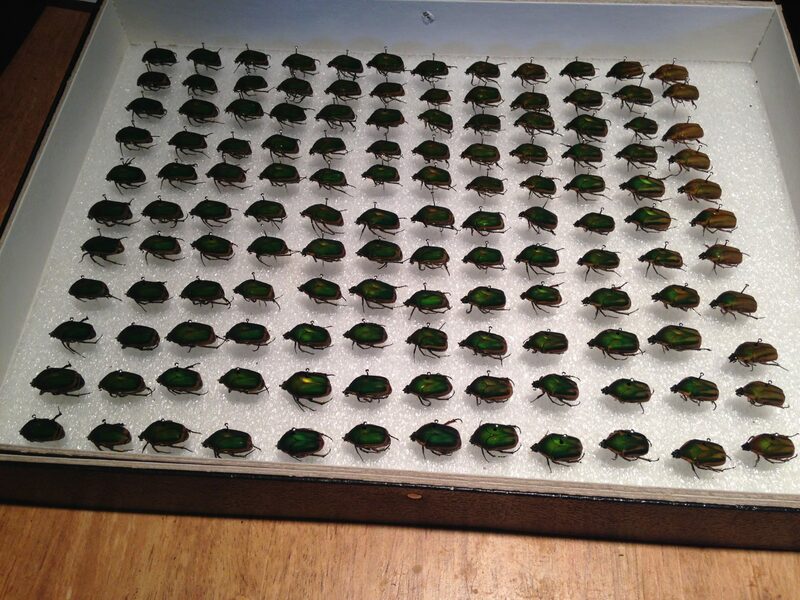 This summer, I collected 133 Green June Bugs Cotinis nitida and then put them in a collection together. This gives students a vivid example of variation in a population. Most of the general public hasn’t seen the slight differences between individuals of the same species. Analyzing these collections can help them see the ingredient of variation that is necessary for of natural selection. 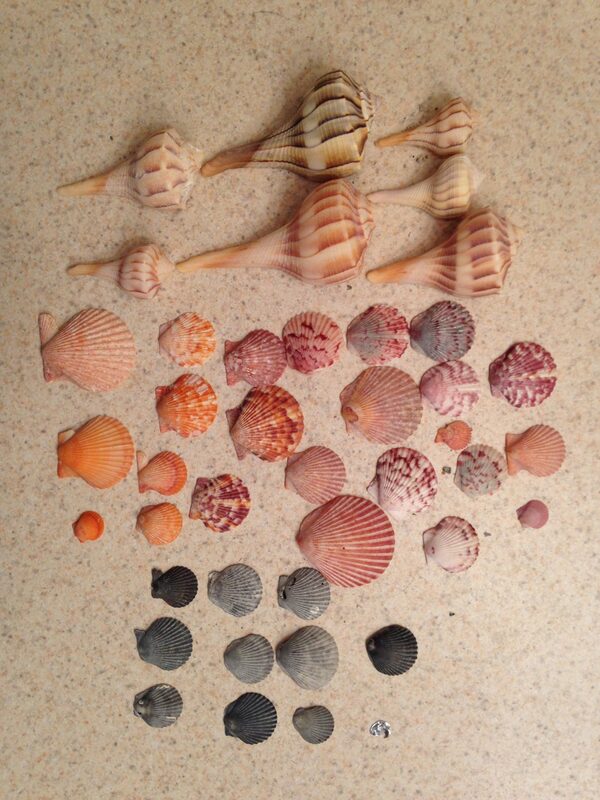 Shells can show this property as well, plus students can manipulate shells without breaking them. Secondly, collections allow students to very vividly see homologous traits and fossil evidence. Last year I got out several of my collections and I had students move from station to station examining evidence for evolution. At each station I had either a fossil, a collection showing homologous traits/variation, a map for biogeography, a specimen with a vestigial trait/atavism, or a diagram showing comparative DNA. Here students examine cowrie shells and find their “tooth like” structure. my goal is that they recognize that these similar species have a common structure due to a common ancestor. Looks like they’re having fun! The students then had to apply what they knew about each evidence for evolution to a novel case. This proved to be a really fun experience for me because it forced me to apply what I was teaching in class to the world around me. If that sounds like a whole lot to chew start with this; collect several pine cones from different species of firs, spruces, and pine. Challenge students with questions about why different species have similar structures. 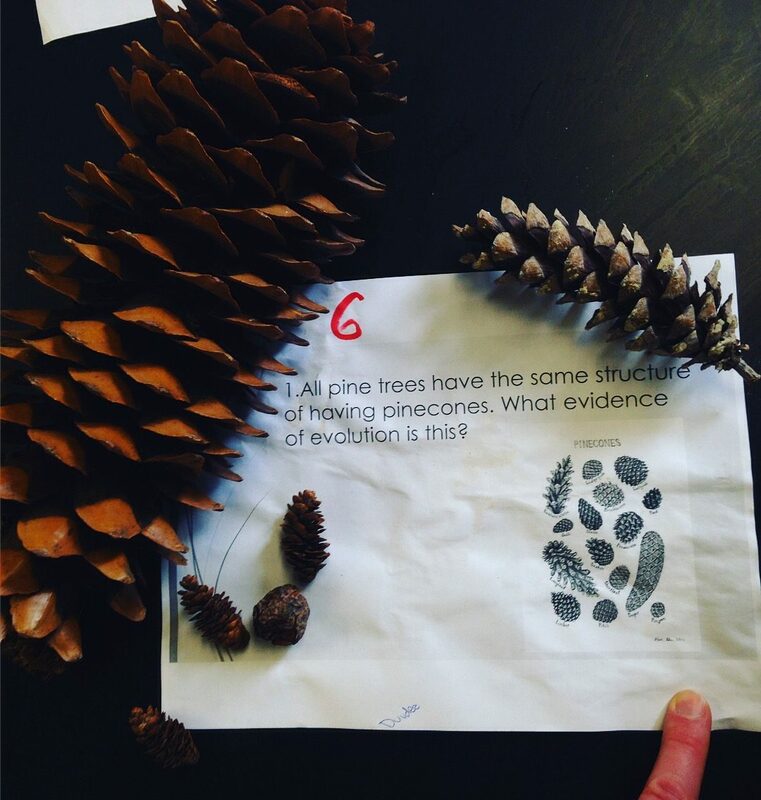 At this station students were asked to consider why pine cones are so similar even though they are from different trees. In the physical examination of these structures homologous traits go from being an abstract idea to a physical reality. Have your students examine these biological forms and identifying them helps you to move them from defining terms to analyzing and applying their knowledge. 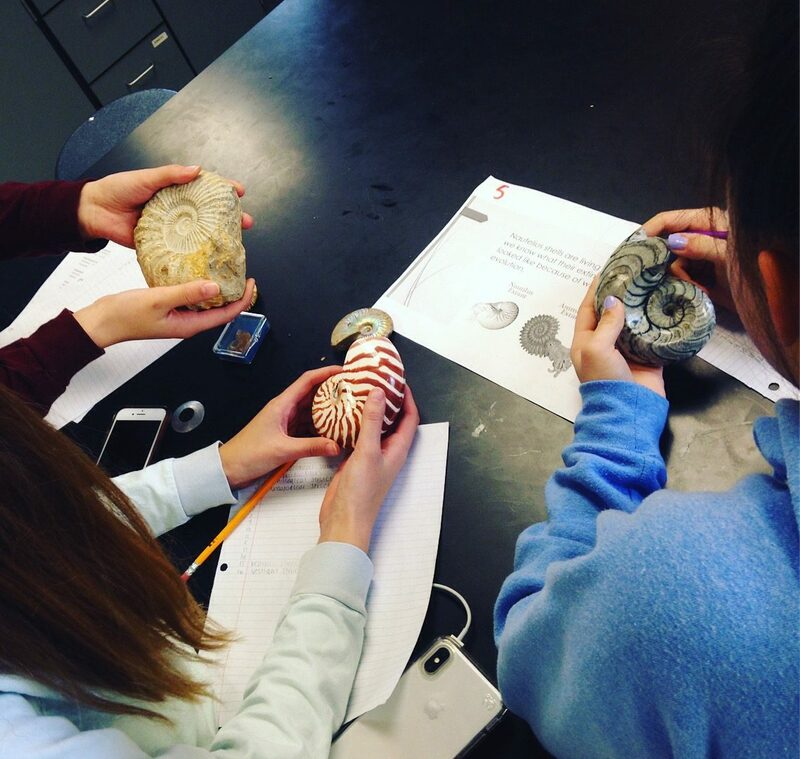 Students comparing fossil ammonites to an extant Nautilus. I like that the evidence is in their hands not on a piece of paper. This allows them a more real chance to engage with the concept of evolution. I originally drafted this “In my classroom” as a way to talk about this cool lab that I used to begin talking about the role of biological molecules in living things. I originally intended to end this with talk of how it was a great lab experience for my students and made for a good model to explain how living things utilize biological molecules. This was all before the recent NABT conference when I learned about the work being done by teachers in Illinois to create phenomenon based storylines as a way to teach concepts and practices from the NGSS. I still intend to say all of those things, but the ending has really just sparked a thousand new fires in my head. Brad’s use of the lighting of the beacons from The Return of the King is in full effect, and I am seemingly humming the score as I type away. A few years ago, an inquiry idea got posted in the October 2015 ABT about utilizing bananas as a model for learning about biochemistry. This year, I decided to utilize the model in my classroom as a way to introduce biological molecules and begin talking about cells and cellular processes. I started with the bananas in class, giving groups of my students (both AP and General) very ripe, somewhat ripe, and unripe bananas. I asked them to use their chalk markers and record as many observations as they could, comparing and contrasting the bananas. I got some predictable responses like their coloration was different, but most made great observations about the texture, mass, and taste of the bananas. My favorite interaction was when one adventurous student informed the class of the taste and consistency of all the banana peels, pointing out that the unripe banana appeared to have a higher water content in the peel compared to the riper specimens. So after all these observations and in class discussion, I directed students to use the two chemicals I had provided them (iodine and Benedict’s solution) and create an assay to observe how they affected the various bananas. We made some observations, and recorded our qualitative data from what we saw. This lead to me revealing that Iodine serves as an indicator for starches and Benedict’s for sugars. At this point we talked about carbohydrates and their overall structure, pointing out that polysaccharides like starches are formed from sugar monomers like glucose. 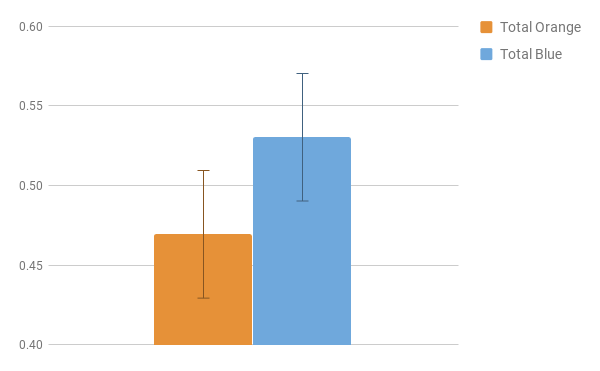 We could see clearly that one banana was strongly positive for the presence of starches while the other was more strongly positive for sugars. This lead to me posing a question. How did all those starches seemingly disappear, and the sugars replace them? My students sat on this for a second. I had to prove that I had not injected them with sugar. Students teetered around an answer, but I eventually had a student in each class suggest that the starches are being digested. I had one student go so far as to name drop amylase. This lead to us talking about chemical reaction that are occurring to break these polymers up into simpler pieces. We modeled what they looked like and investigated the role and structure of proteins, particularly amylase. 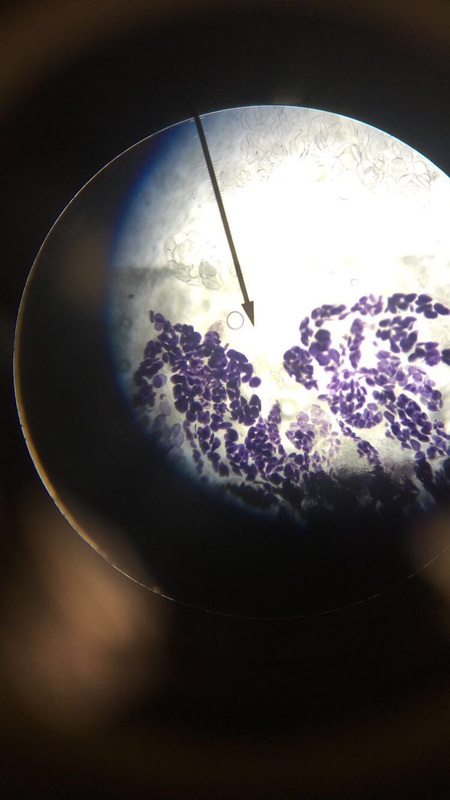 With the last few minutes of class, we broke out the microscopes and identified cells that had been stained with iodine to indicate the location of starches in the cells. My students were super engaged with the whole process. We had a small writeup to summarize and model the processes we had observed. But that was kind of the end. We still talked about these things in class, but I left a pretty cool phenomenon just hanging there. A student slide of unripe banana stained with iodine to highlight the presence of starch (in this case amylose). As previously stated, I got to see some awesome phenomenon based teaching from my experiences at NABT, and am looking at next steps with my students. Jason Crean from the Illinois Association of Biology Teachers has formulated these NGSS storylines in his class following specific organisms and phenomena. 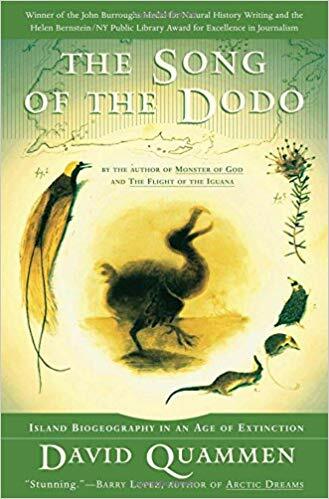 His phenomena are very heavily focused on real data from collaborations with zoologists and some of his work can be found at http://www.xy-zoo.com/. His focus is on how all of the content standards in the NGSS connect to each other in an engaging and coherent storyline, all sparked by an investigation into a particular phenomenon. While thinking about writing this post, it occurred to me that the banana lab seems like a great piece in the puzzle to start my own conceptual storyline unit on how “We are what we eat.” In my head, this will be something that delves into why some people have trouble processing certain foods and how malnutrition affects us. I have shared a little bit about this idea already on a Facebook post, and am now looking into a collaboration to produce some conceptual storylines that follow phenomenon, not just the order the standards are packaged and delivered to us. I realize there is safety there, but safety has never been fun. I really like the HHMI Biointeractive activity “Battling Beetles”. I have used it, in some iteration (see below), for the last 6 years to model certain aspects of natural selection. There is an extension where you can explore genetic drift and Hardy-Weinberg equilibrium calculations, though I have never done that with my 9th graders. If you stop at that point, the lab is lacking a bit in quantitative analysis. Students calculate phenotypic frequencies, but there is so much more you can do. I used the lab to introduce the idea of a null hypothesis and standard error to my students this year, and I may never go back! 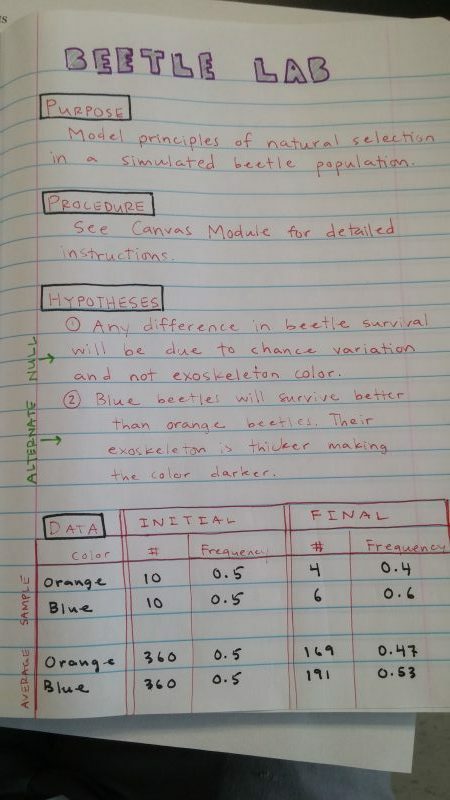 We set up our lab notebooks with a title, purpose/objective statements, and a data table. I provided students with an initial hypothesis (the null hypothesis), and ask them to generate an alternate hypothesis to mine (alternative hypothesis). I didn’t initially use the terms ‘null’ and ‘alternative’ for the hypotheses because, honestly, it wouldn’t have an impact on their success, and those are vocabulary words we can visit after demonstrating the main focus of the lesson. When you’re 14, and you’re trying to remember information from 6 other classes, even simple jargon can bog things down. 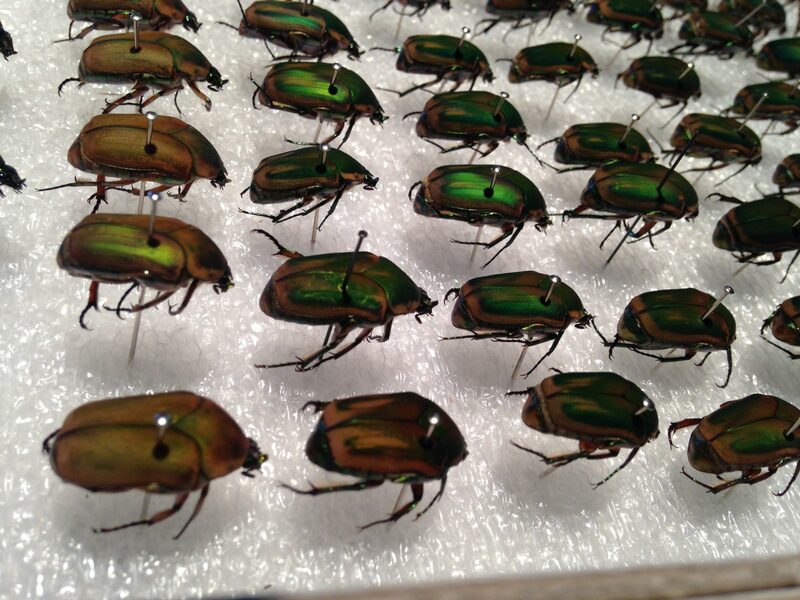 I had students take a random sample of 10 “male beetles” of each shell color, we smashed them together according the HHMI procedure, and students reported the surviving frequencies to me. Once I had the sample frequencies, I used a Google Sheet to find averages and standard error, and reported those to my students. Having earlier emphasized “good” science as falsifiable, tentative and fallible, we began to talk about “confidence” and “significance” in research. What really seemed to work was this analogy: if your parents give you a curfew of 10:30 and you get home at 10:31, were you home on time? It isn’t a perfect comparison, and it is definitely something I’ll regret when my daughter is a few years older, but that seemed to click for most students. 10:31 isn’t 10:30, but if we’re being honest with each other, there isn’t a real difference between the two. After all, most people would unconsciously round 10:31 down to 10:30 without thinking. We calculated the average frequency changed from 0.5 for blue M&M’s to 0.53, and orange conversely moved from 0.5 to 0.47. So I asked them again: Does blue have an advantage? Is our result significant? Error bars represent 95% C.I. (+/- 0.044) for our data. Short story, no; we failed to reject the null hypothesis. Unless you are using a 70% confidence interval, our result is not significantly different based on 36 samples. But it was neat to see the interval shrink during the day. After each class period, we added a few more samples, and the standard error measurement moved from 0.05 to 0.03 to 0.02. It was a really powerful way to emphasize the importance of sample size in scientific endeavors. Should the pattern (cross-cutting concept!) hold across 20 more samples, the intervals would no longer overlap, and we could start to see something interesting. So if anyone has a giant bag of M&M’s lying around and you want to contribute to our data set, copy this sheet, add your results, and share it back my way. Hope we can collaborate! I got some really great news recently: some of my biotech students from last year are insisting that the program live beyond my tenure. 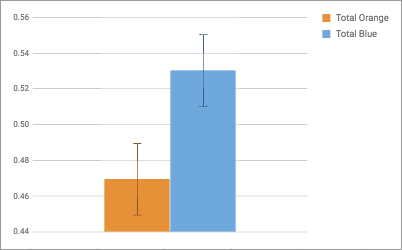 The students who persist are not your typical advanced science participants (both were new last year and had zero science training beyond their graduation-required science courses). They found a sense of purpose and belonging and I’m really moved that they are exercising their agency. The program is more than the principle investigator. They have a new sponsor and the question has turned again to, “What the heck is the Biotech program at Olathe East?” This is an open letter to the new sponsor, and I share it here so my debrief can be of value to anyone else considering something weird. Here we go. We did everything like a grant-funded university research lab. Every question was, “How do professionals do it? We will do it like that.” There was no pre-planned curriculum. There were no tests. There were no points. One thing matters: the question. Can we get methanotrophs out of there? The joke gets made frequently that, “[some biology topic] could be a whole course right there!” Ha ha, but it won’t be… Well, this was that course. From day one, I assigned new students to help me address my question. Train on taking water samples, learn to cell stain, build me a sensor… we’ve got stuff to do. When they needed chemistry to mix the Nitrate Mineral Medium 2014 (NMM14), we’d stop and learn it. When pressure gradients were needed to understand a sampling design, we’d learn that too. Professionals have meetings, so we had them. Professionals present at conferences, so we did that. Professionals do outreach, so it’s on the calendar. WWPD, all day every day. When students started to become more comfortable in the space, they invariably start having ideas and asking questions. We’d follow the postdoc model and let them split their time. My veterans of several years would have the freedom and authority to oversee an entire research team. Students specialized and began to follow their own interests, while still having responsibilities to the original investigation. Take home recommendation: craft your own driving question. It’s got to be really good. Then focus on nothing else. Only one thing I can’t use… a credit card. Necessity is the driver of innovation. We performed robust biogeochemical analysis with scraps and pennies. Only 1 of our 5 years did we have any dedicated budget (it was in the middle and it went away again). Scrap lumber from theater, scrap electrical from district contractors, spare keyboards from IT, waste planters from horticulture… being efficient scrappers was so ingrained in everyone’s attitude that when we did the final tear down I had to throw many of the items away myself because students could not be convinced anything was trash. Big flashy equipment is a crutch when students don’t yet understand the fundamental concepts they’re investigating. When you really commit to finding a way, it’s amazing what you can make work. 3D print parts rather than buy them. Leftover dry ice in shipping materials. Creating long-term storage cultures in the freezer rather than reordering. Mixing your own bacterial media instead of pre-made. It makes the program cost-effective and the students see more of what goes into the project. They understand the bacterial medium because they had to make it. Sterilization makes sense because it was a total pain to sterilize that equipment. Take home recommendation: fancy equipment and protocols are not the point. They take great pictures, but they aren’t science. This stuff is hard and making any arbitrary technique the course focus will obscure what it actually means to learn in a biological research space. Anyone can help those who can already help themselves. A good driving question is both accessible and complex. That means nobody who hasn’t intentionally trained in that area will have strong background knowledge on how to investigate it. The end result is who cares what level of math they’re in?!? AP Biology students know as much about methanotrophy as freshman (in every practical sense). We have a serious exclusion problem in high school science; don’t be a part of that problem. Any student… ANY STUDENT… who is interested and willing to join should be welcomed. I have a litany of “not science students” in my alumni base who made powerful contributions to our project. I had freshman leading research teams, remedial students self-identifying as mycologists, and more. There are plenty of biotech programs out there, collegiate and high school. They are picturesque spaces with students in lab coats wearing goggles staring intently at test tubes. They burn through budgets and look great on resumes. The problem with these programs is the course has become about the techniques. Put your hands on an electrophoresis chamber. Check. Touch a thermocycler. Check. These are Petri dishes. Moving on. Biotechnology in the industry sense is a highly derivative field that requires expertise in more than a half dozen disciplines. Our high school students are not that. Indeed, the few who can be have boatloads of options for how to pursue enrichment. The world doesn’t really need an expensive, esoteric course to serve the 1 or 2 students a year ready for that kind of work. Take home recommendation: Get Them All Involved. I’m not saying tolerate distraction, destruction or ineffective behaviors. What I am saying is it’s easy to quibble with the all the other programs about that top 3% of students who will spin gold in any classroom. Instead, find all the other students who just want to do something meaningful… and give them some sweet science to explore. There’s so much more I think and want to say, but ultimately this post is prompted by students. Let the program be theirs. For that matter let it be yours too. Don’t investigate methanotrophs, find your own thing. Let the students help you decide what that might be. Talk with others in the field when you need help. The putting greens are pleasant, but well-traveled. Get out in the weeds a bit. And post about it. A very proud former investigator will be following your progress.